Well, this one has a long story behind it, but I’ll keep it short. I had to try sewing with some chalk cloth a long time ago. Perfect table topper for our play table. 1. Lay down chalk cloth right side up, lay table top down on top of it. 2. Trace with chalk around your table. 4. Prime the chalk cloth by rubbing chalk all over it and wiping off. 5. Sew 1/2″ double fold bias tape around edge using a denim needle (the chalk cloth is pretty thick). It’s really been nice having it, the topper doubles as a table cloth and protects the table. And what kid (or adult) doesn’t love chalk? I do! Thanks so much Delia for putting together another round of Color Your Summer! I’m so happy to be joining in this year. I definitely can relate to PINK, after all I’ve got two little girls who both love pink. I tried to convert them to liking other colors, was pretty sucessfull for a while. My oldest liked red for a long time, my youngest used to love blue, but now they both change their minds almost daily (like their mother perhaps?!). So I figured they might give me some inspiration for this Color Your Summer project. It worked pretty well. I definitely think they’ll be giving their friends these fabric friendship bracelets. These are so easy and quick to make up, use your favorite fabric and you’ll have plenty leftover. Just don’t forget to share them with your friends! Measure your wrist, below is an example of my wrist and how I got the measurement. Cut your fabric, fuse on interfacing if you choose to use some). I used Robert Kaufmann Essex Linen in Hot Pink! Press the fabric in by 1/4″ on all 4 sides. Fold in half lengthwise again. Braid three strands of embroidery floss. Make two, about 6″ long, tie knots at each end on both pieces. Sew around all four edges, tucking the braided ties into each end as you go. Wear and share with your friends! Very honored that my friend Rachel of Stitched in Color asked me to hang out today and post up a little tutorial for Celebrate Color! If you haven’t been following along, catch up on all her posts here. Today I thought I’d share a quick little cardi you can make for that sweet little girl in your life (or heck, you could even make one for yourself!). When I think of fall I think of bright saturated colors, so that’s what these little cuddly layers represent. It’s fun, quick, and super easy, I promise. All you need is some knit fabric, a ballpoint sewing machine needle, and some double fold bias tape. I decided it might be easier to include a couple pattern pieces for the cardigan (download from link above), I made a size 2/3T and a 5T. 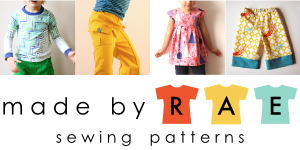 You can choose to use the pattern pieces or you could make your own, or if you have a simple raglan tee pattern you can modify that. It’s quite forgiving, and quick, so if you don’t get it right the first time, give it another try! Assemble pattern pieces, cut desired size and tape together at matching letters on pattern pieces. Cut two body pieces on the fold and two sleeve pieces on the fold. Next, place the cardigan flat right sides of facing. Pin. Sew, going under the arm continuing down the body of each side. Lastly attach the double fold bias tape to the neck edge, leaving a tail of tape on either side. You can either sandwich it on, or open it up, stitch on the fold then fold it over the knit to the other side and sew, being sure to sew all the way to the ends of the tape. Tie a knot in each end of the tape, plop it on a cute kid, and you’re ready for fall! And if you’re new to sewing with knit fabric, Luvinthemommyhood and I had a fun little series with tons of great tutorials and tips, find them here and here.